The pair trudged through the icy rain — it seemed to always be raining on Quel’Danas, icy needles of water unlike the fat wet drops the pair was used to in Loch Modan or the Wetlands; proper dwarven rain — toward the harbor building. As they did, an armored draenei flew overhead on a Shattered Sun dragonhawk, waving in response to the cheers from soldiers as he landed on the deck of the Silvermoon’s Pride, docked in the harbor while the ship was being repaired. Ringo and Beli followed the crowd and crossed the gangplank. 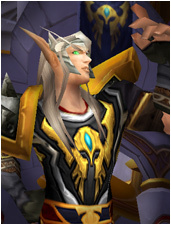 General Tiras’alan was shaking hands and preparing to speak as a pair of elves hurriedly hoisted banners behind him. Here, the naaru’s hum could be heard to form a melody, subtle and pervasive. 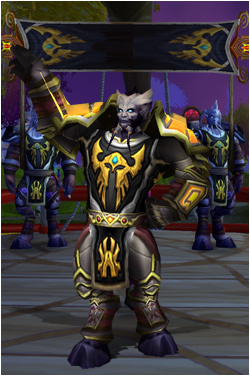 “Exarch Larethor, Captain Dawnearth, officers and sailors of the Silvermoon’s Pride, my fellow soldiers of the Shattered Sun Offensive,” Tiras’alan called out, his voice carrying across the harbor. 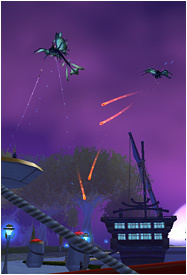 “Major combat operations in Quel’Danas have ended. In the Battle of Sun’s Reach, the Shattered Sun Offensive and our allies have prevailed. And now our coalition is engaged in securing and reconstructing this land. Shadows fell across the crowd, as a trio of Dawnstrider Hawkriders soared overhead, firing flaming arrows down into the crowd. There were shouts of surprise, but the Shattered Sun Offensive knew how to deal with this: Ringo and a host of other soldiers turned and began firing at the riders, who spiraled down down to earth a moment later. A mage on the podium cast a portal spell, and a moment later, Tiras’alan was gone. The shadows of more hawkriders raced across the ground. Ringo reloaded and jerked his head toward the Sunwell Plateau, where the Sunblade elves seemed similarly unaware that they had been beaten, given the flaming arrows now arching down toward the harbor. About frickin’ time he showed up. I’ve often wondered why the naaru, who possess such great power, are always leaving us to do all the work and then coming about to claim the victories. But then, I’m not entirely sure I trust them, anyway. That one naaru in Nagrand makes me think that there is more to these glowing beings than meets the eye, and while we’re fighting off their enemies, I can’t help but wonder if they’re preparing for their own war. Or something worse. What an amazing account! I had suspected he would have ported in unannounced at midnight, had a fifteen minute portrait opportunity inside a building surrounded by a phalanx of heavily twinked palace guards before porting out. I guess he finally grew some stones (or else he believed his own staff’s assurances that the battle actually was finished.) Hehe. The war continues.